The Memorial Candle Program has been designed to help offset the costs associated with the hosting this Tribute Website in perpetuity. Through the lighting of a memorial candle, your thoughtful gesture will be recorded in the Book of Memories and the proceeds will go directly towards helping ensure that the family and friends of Bessie Smith can continue to memorialize, re-visit, interact with each other and enhance this tribute for future generations. 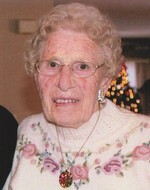 Passed away peacefully at Dufferin Oaks on Thursday, November 12, 2015 in her 93rd year. Beloved wife of the late Henry. Loving mother of Clinton & Arlene and the late Edward. Proud grandmother of Brad, Paul (Lisa), Christina (Jon), the late Douglas, Eryn (Imraan) and Trevor (Rachelle) and great-grandmother of Lauren, Jordan, Luke, Alexander and Jackson. Dear sister of Olive and Marie (Frank). Predeceased by 4 brothers and 4 sisters. Friends and family will be received at the Jack & Thompson Funeral Home on Monday from 7-9 p.m. and on Tuesday from 11 a.m.-1 p.m. The funeral service will follow in the funeral home chapel on Tuesday, November 17, 2015 at 1:00 p.m. Interment at Shelburne Cemetery. If desired, donations to Dufferin Oaks or Trinity United Church would be appreciated.